We shared our favourites cafes and best-kept secrets in the West of Singapore previously, and today, we will let you in on our picks from the East. There are gelato bars, coffee studios, kids-friendly cafes, cake lovers’ heaven and so many more. Characteristic and thematic in their own rights, these finds make great hang-out places and some are already our regular haunts. Some are a stone’s throw from town, and they are alternatives to go to when you need to get away from the crazy crowd. Else, there are cosy units that serve burgers and truffle fries that pack a punch. And we won’t say no to more options for our daily cuppa. The East is a lovely enclave of artisan finds, serious brews and comforting brunch food. We are real advocators of quality over quantity, so while there may be hundreds of names out there, we really prefer sticking to the ones we know we can count on for good food and drinks. Situated in the Kallang industrial area, Backstage offers a cool respite for those seeking a break from the weekly humdrum at work. 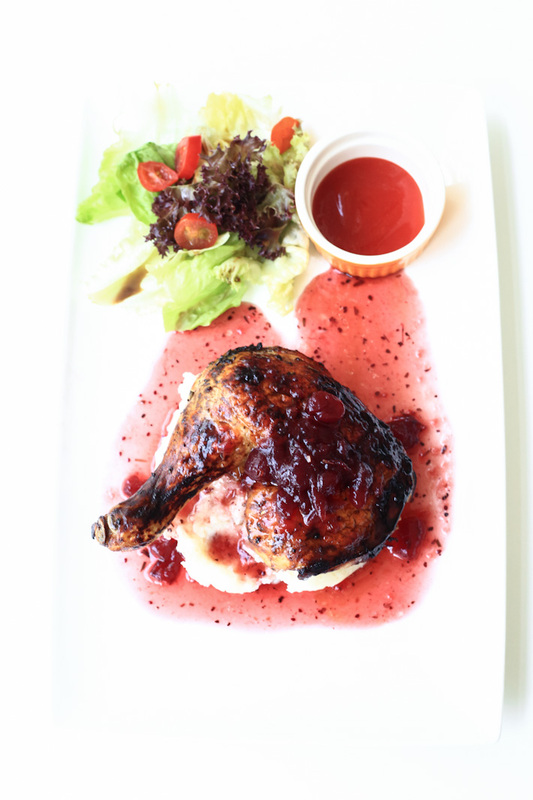 Look out for its Duck Confit ($18), Roasted Spring Chicken ($15) and Beef Burger ($17) for its mains. For dessert, you shouldn’t miss the café’s rainbow ($7.50 a slice) and red velvet cakes ($6.50 a slice). 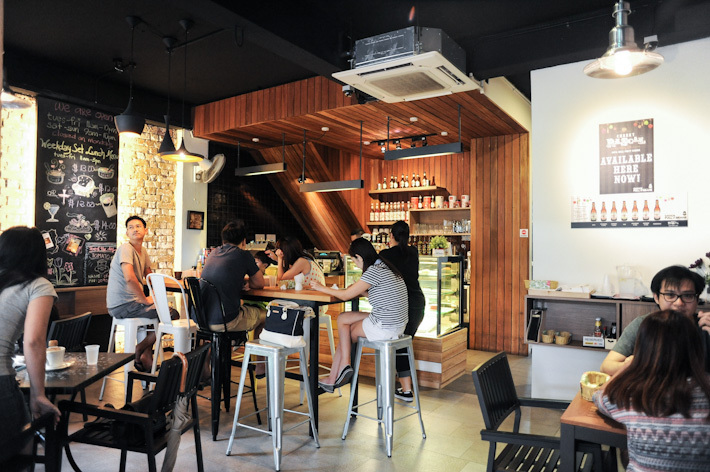 Here’s our guide to 27 cafes in the West of Singapore and we hope that it will spark some venturing out and give you some ideas on where to eat out at next. Cafes and dessert shops are always offering the ubiquitous fare – copying one another, following the crowd and what not – so how do you stand out? How’s it if you can D.I.Y your own coffee and bread buns (like Shibuya toasts) with wooden blocks equipped with RFID tags? Blocs Inc. is one cafe to look out for, and they are making waves in the industry by introducing this unique concept, unlike any that we have seen here in Singapore. Tucked away in the iconic Singapore Badminton Hall, Brawn & Brains provides a nice and fresh twist to the older surrounding buildings. The clean interior of the cafe allows for ample natural light to stream in – making great Insta-worthy moments. Black&Ink is one place to get your coffee fix, with beans sourced from a local micro-roaster and served in beautiful and classy glass cups that will look so good in photos. Their coffee, in our memory, had a distinct robust element to them. Cakes and pastries are also offered at the cafe with crowd favourites such as the Earl Grey Pound Cake (S$5) – which was moist and buttery, much to our delight. We always love a good “glasshouse cafe” with high ceilings and ample sunlight streaming in. 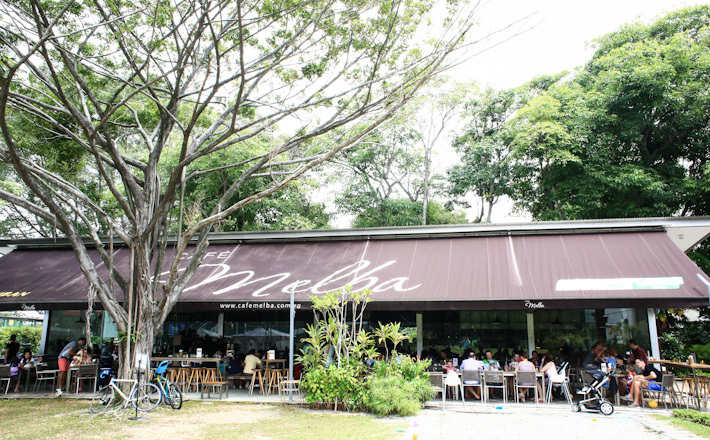 Cafe Melba is one of those rare ones like that in Singapore, with both indoor and outdoor seating, a family-friendly environment, and honest food for the tummy. We popped by on a weekend for brunch, and fell in love with the truffle fries and Homemade Brioche French Toast. The Eggs Florentine and pancakes were decent, too. Carvers & Co got our attention for their concise and highly-raved menu. It does not have a fancy decor to boast of, but it seems they are a comfort for many residents. They’ve got different menus for weekdays and weekends, and even lunch and dinners differ. The deals on weekends are surely more enticing, and you can expect dishes like Truffle Eggs on Toast (S$15) and Earl Grey French Toast (S$16). A café that serves adorable 3D latte art, how cute is that? We found Chock Full of Beans sitting in a quiet corner of Changi Village (right next to the hawker centre), and were drawn towards the latte art that was on display. While we were bowled over by the baristas’ serious attention to detail, we also enjoyed the cafe’s Iced Rose Latte and Lychee Lime Cooler. 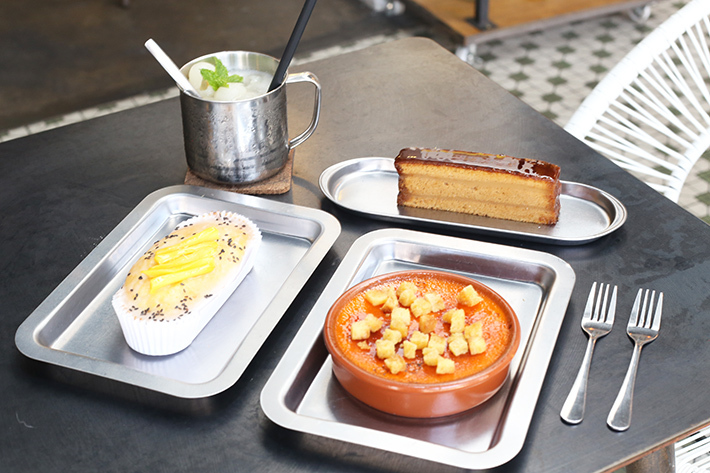 If you’re there for a meal, Chock Full of Beans serves mains and desserts, too. 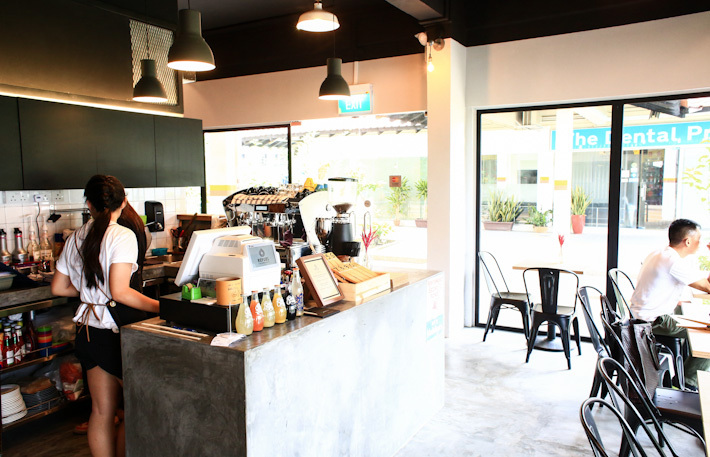 One of the newest cafes to open in the East, Craftsmen Speciality Coffee at Siglap V has already garnered a strong following among locals and expats who reside in the hood. 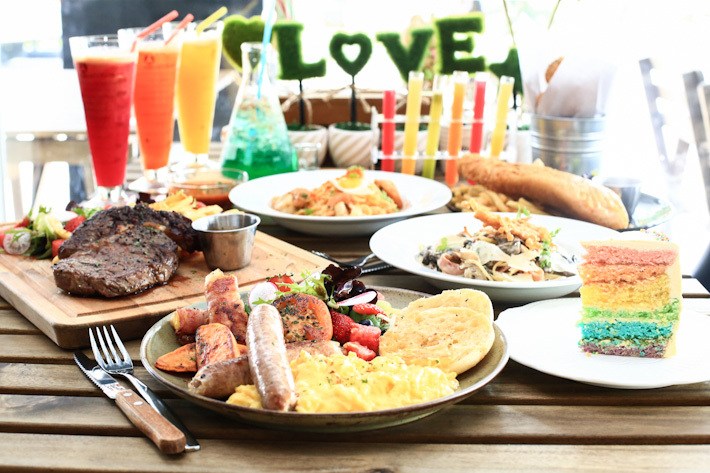 The food menu is simple and it is made up of mainly all-day breakfast and brunch items like Croissant Sandwiches (S$15), Toast (S$5 – S$15), Pies (S$9.50 – S$12.50), as well as sweet and savoury Waffles (S$15). A coffee shop that started with a humble beginning at PasarBella, Dutch Colony Coffee Co. now has its own coffee roastery and academy at Defu Lane, as well as its new full-fledge cafe at Frankel Avenue. 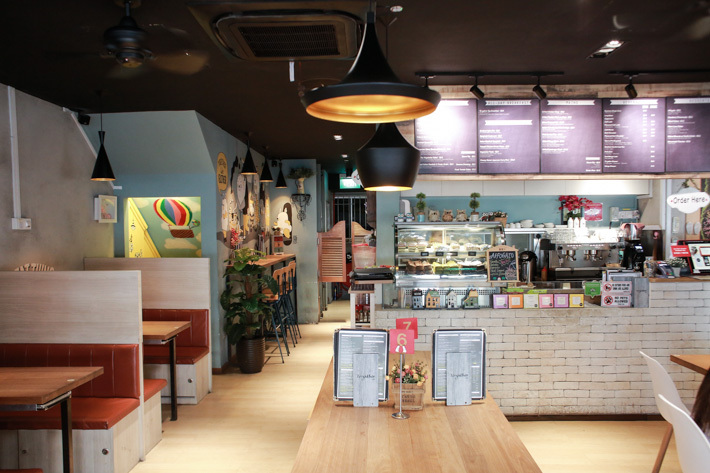 We love the vibe of the new outlet in the Siglap neighbourhood. Other than coffee, Dutch Colony Cafe also serves a small selection of breakfast (S$5.50 – S$10), sandwiches (S$8 – S$14) and cakes on its menu. If you’re looking for a café to grab Instagram-worthy pictures, Fart Tartz’s probably it. The café first grabbed our attention with the rows of adorable-looking mudpies ($5.50 each) that look like potted plants and cakes in old-school glass jars, but there’s definitely more to it. 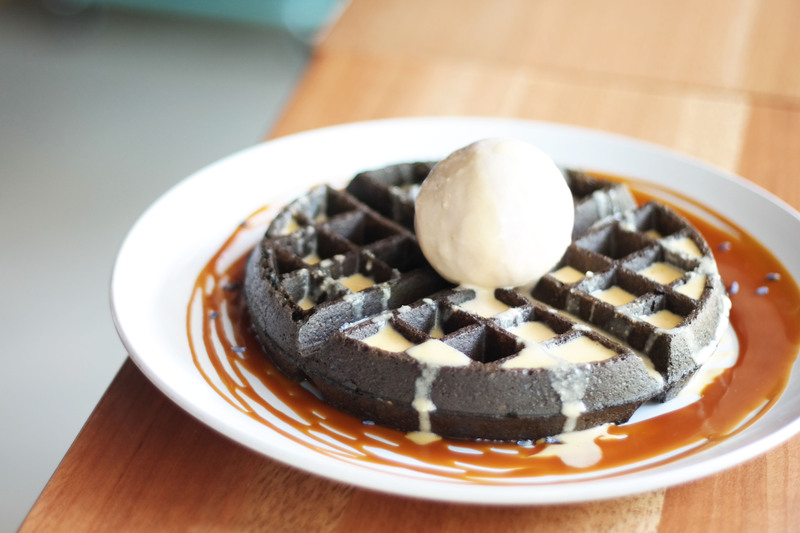 FATCAT Ice Cream Bar isn’t just known for their perfect mojito spheres and range of artisanal ice cream, they also serve a mean plate of Charcoal Waffles with Salted Egg Yolk Sauce and salted caramel sauce (S$11.50 with a scoop of premium ice cream). Amazingly, the waffles do not get soggy even after adding on the accompanying sauces. 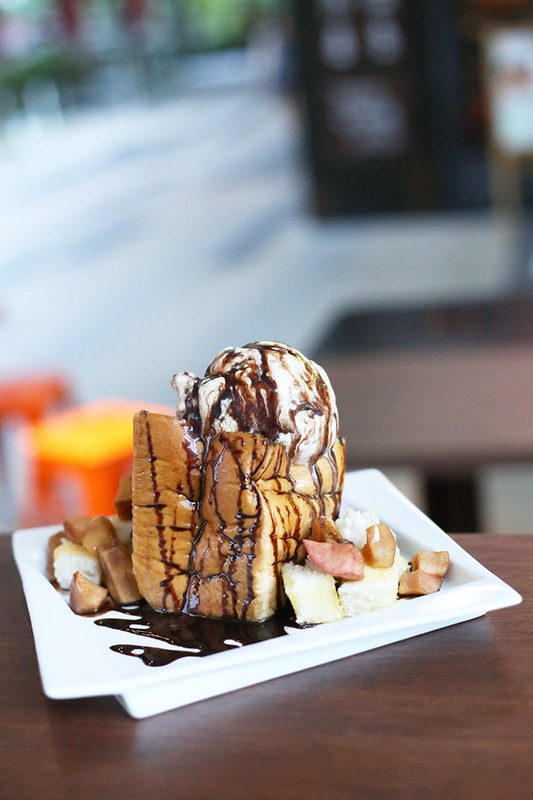 FATCAT Ice Cream Bar is also listed in our guide to the 12 Most Unique Waffles in Singapore. Located in the Kembangan neighbourhood, Fresh Fruits Lab is a must-visit for folks who are staying in the East of Singapore. It is a bright and cheerful spot that is tastefully designed to a laboratory theme. Think iced water served in beakers, and fruit juices served in test tubes and conical flasks. The menu is also specially designed to incorporate a fruity element; even their side salads for the main courses come with generous chunks of fresh fruits. 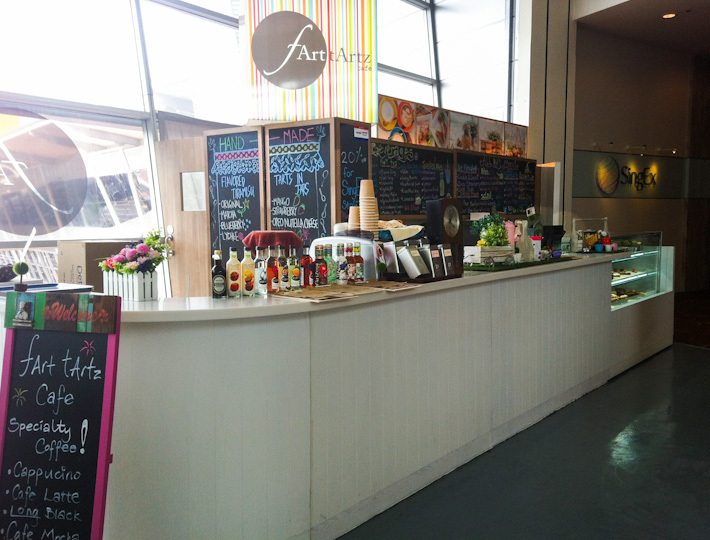 Fans of Group Therapy Coffee will no longer have to travel to the CBD area for their Roasted Almond Latte, for it now has a second outlet in the East of Singapore at Katong V. The menu is slightly different from the original outlet at Duxton Road, but the idea is the same – good comfort food at affordable prices for the masses. 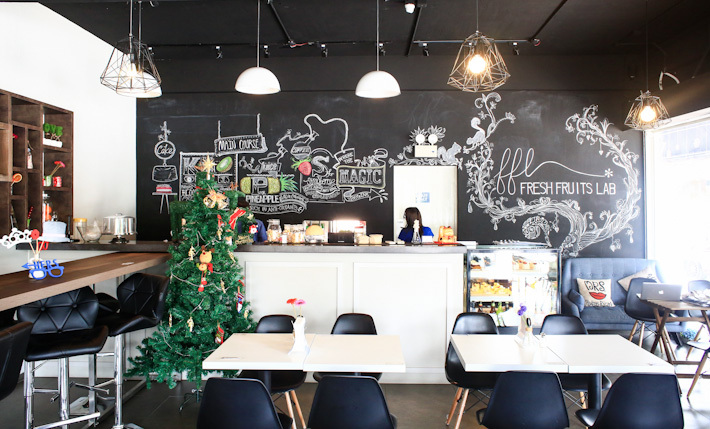 Quite possibly the first cafe to open in a community club, Nom Bistro & Bakery is a simple and no-frills cafe that serves homemade fare at inexpensive prices. Main courses include Beer Battered Fish & Chips (S$12.90), The Ultimate Burger (S$12.90), and Slow Roast Chicken Leg (S$12.90). Nom is also known for its rainbow cakes which are available in oreo, salted caramel and chocolate flavours. Predominantly brown, Percolate Coffee sits about 20 people, with small wooden tables and chairs, and a simple vase of Baby’s Breath on every table. Nothing overly pretentious or chi-chi, just a space for you to unwind over a cuppa and light music. Coffee beans are from Papa Palheta and Nylon Coffee Roasters, so you can take your pick on your Whites and Capps. They do pretty decent latte art, and we love how the white cups sit against its wooden furnishing. Quaint afternoons are made up of these. 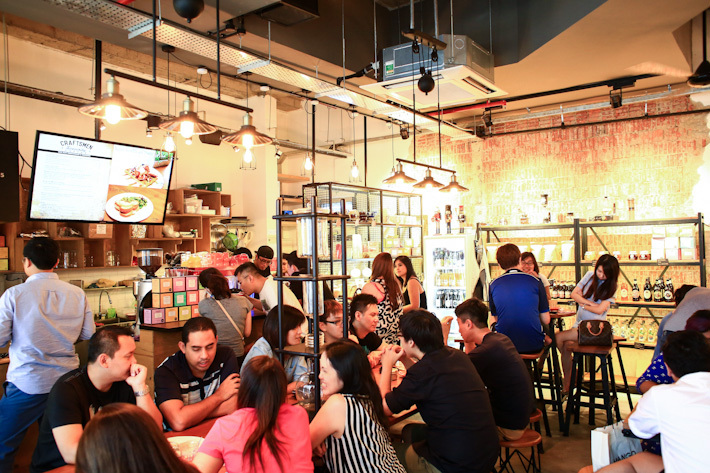 Located next to Margarita’s Mexican Restaurant, Penny University is a popular destination in the East of Singapore for coffee lovers. The cafe sources its own beans from local coffee roasters. The menu features a simple lineup of breakfast items and sandwiches – Eggs Benedict with Smoked Salmon (S$12), Turkey Ham & Cheese Croissant (S$5), Smoked Chicken Breast on Sourdough Toast (S$8) and Turkish Poached Eggs (S$8). With a tongue-in-cheek name like Rabbit Carrot Gun, it is hard to not do a double take when you walk past this watering hole along East Coast Road. Like its name suggests, Rabbit Carrot Gun does not take things too seriously. The menu is full of quirky dishes that fortunately turns out fairly well. 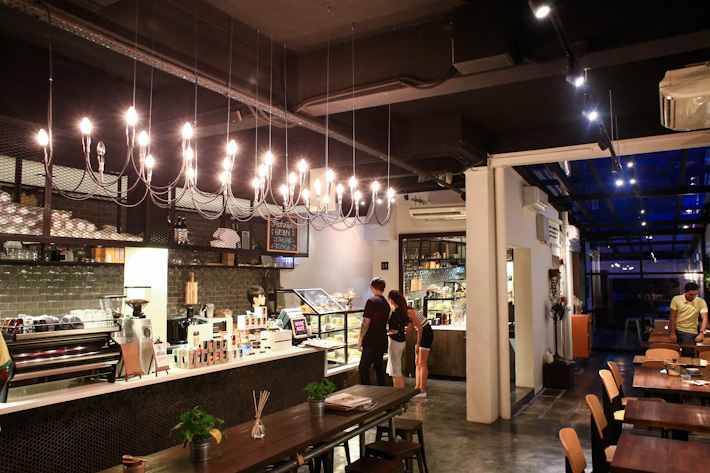 Established in October 2014, Refuel Cafe provides residents in Bedok with another option for brunch and brew. With a simple but welcoming space, Refuel offers a comprehensive menu that is unpretentious and affordable. The brew is pretty decent, and we’d do that stack of salted caramel pancakes (S$7.90) anytime. 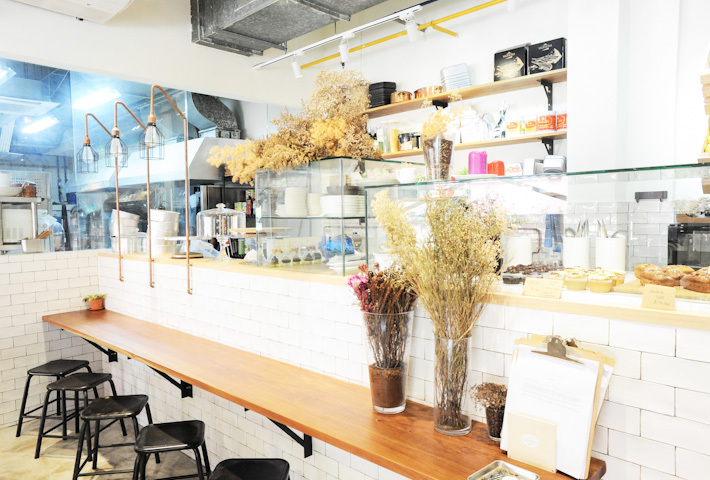 This pretty cafe sits along Tanjong Katong, and we love it for its clean, rustic and cosy space. The menu is not the biggest, but it suffices to keep us happy with its casual breakfast and dinner options. There are Small Plates and Big Plates options, so you can choose to care and share, or be a glutton and have a dinner main to yourself. Specialty coffee is also served here. Previously located at the old Dakota estate, Tian Kee & Co has reopened a new takeaway outlet at 46 Siglap Drive, off Frankel Avenue. 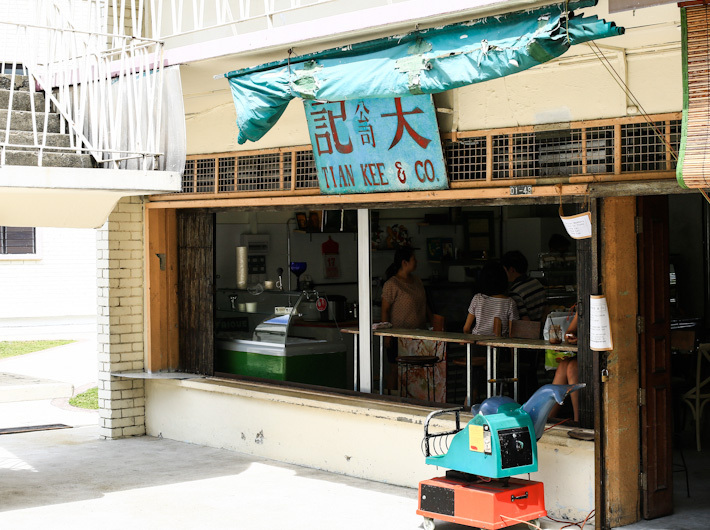 For those of you who are not familiar with Tian Kee & Co, it started as a local provision shop back in 1958 and it evolved into a bakery cafe at Dakota Crescent—one of Singapore’s oldest public housing estates. Unfortunately, the neighbourhood had to make way in late 2016 due to developments under Mountbatten’s estate renewal plans, and so did Tian Kee & Co. 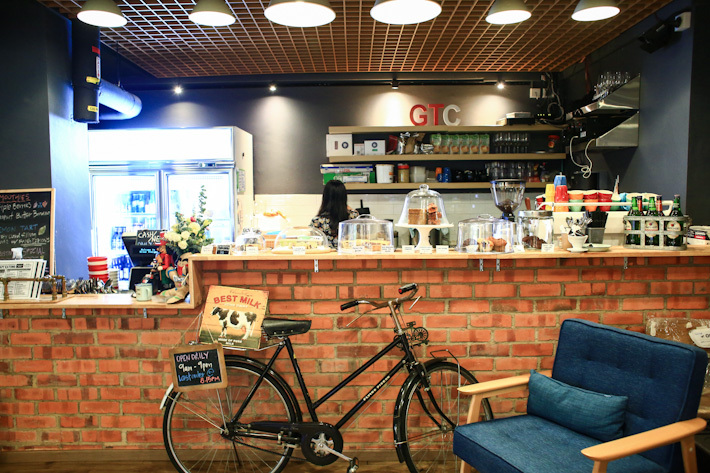 While there are many concept cafes in the East of Singapore, To-gather Cafe in Bedok (next to Fengshan Market) is one gem where you can unwind from work. Walk into the cafe and you will notice that cursive writings of inspirational quotes and song lyrics fill up the walls in the most elegant manner. There is also a wall featuring post-it notes with messages and compliments penned down personally by customers. The best part? Most of the main courses are affordably priced under S$12. 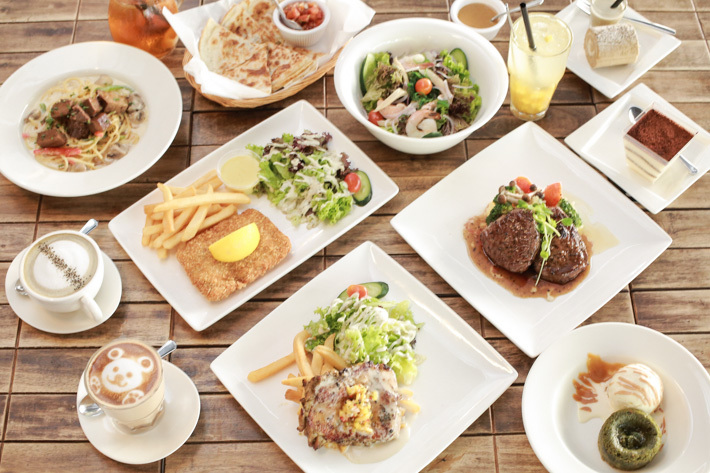 To-gather Cafe is one place where you can have a good meal without breaking the bank. There’s a new cafe up in the east too. 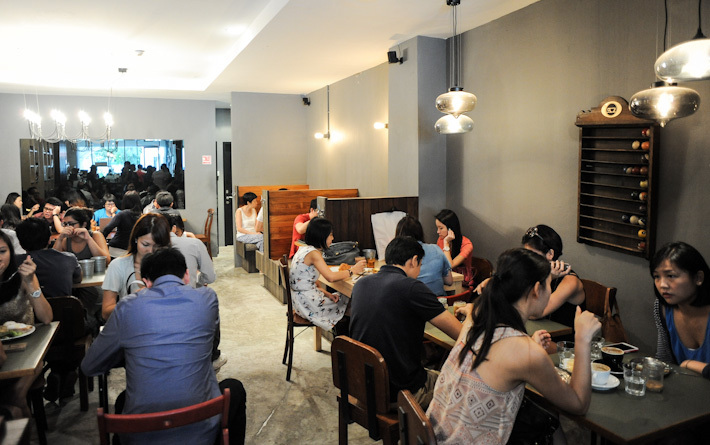 Collective Brewers at Changi Road, same stretch as Fresh Fruits Lab. I love cafe melba! The food there is really fresh and tasty…!!! So glad it made it on the list. backstage cafe used to be good. Recent visit, my 3rd visit, is awful. Food and coffee are equally bad. Give it a miss. I beg to differ! I would personally recommend backstage cafe if you are looking for a quiet place to spend some ‘me’ time! A place with really friendly staff offering personalized service! Nothing fancy as compared to others but a place to hide and recharge. Also, I like it because I don’t have to worry for parking too! Brawn and Brains is missing too! There are quite number of Muslim owned cafe/shop nearby! Hope this helps for Muslims out there! How about Holqa Cafe and Bakers Well! There are pretty good too! Love the paddle pop ice cream at Holqa Cafe. Rice & Fries at 484 Changi Road. Great food at reasonable price. The lambshank is my hubby’s fav! 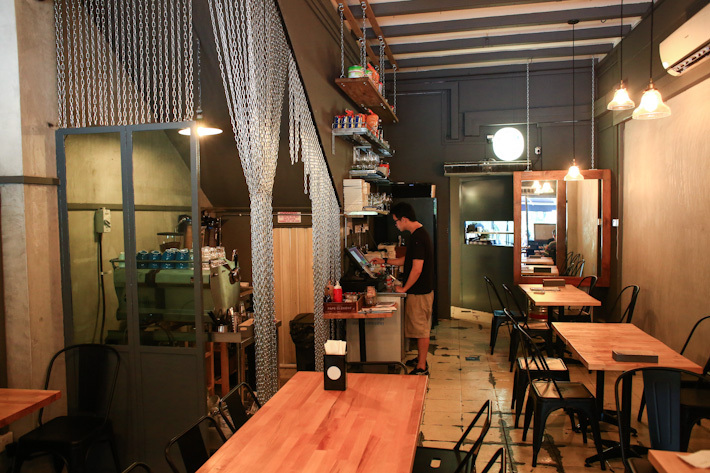 how about toothsome cafe at 368 Tanjong katong road just down the road after laneway? It’s pretty awesome for some me-time and superb service too.. Their seasalt caramel cake and chocolate mousse are just way too good. What are some halal cafes in the list/out of the lists? Btw these are good to try someday, thanks. 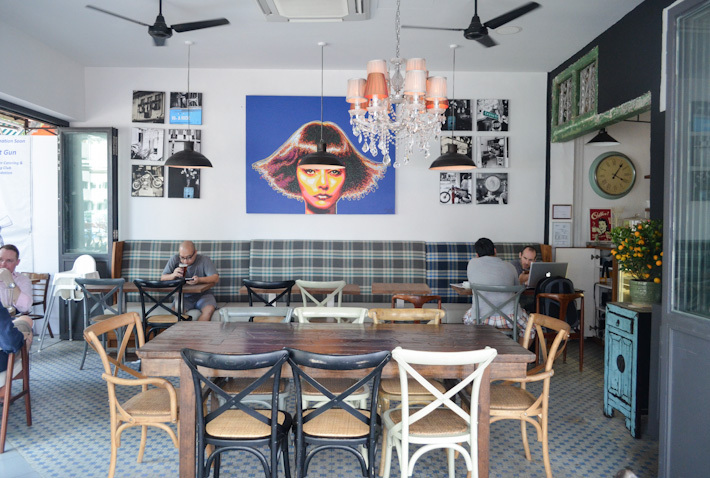 Was searching cafes in siglap and we came across a newly opened cafe called Cafe de lalaland. Superb coffee, one of the best I’ve had in awhile. Should be on this list!